Google AdSense has introduced a new type of Ads format for publishers. The new format called Page-Level Ads is still in beta and has made available for select AdSense Publishers only. The new Ads formats allow the publisher to add two new, different kinds of Ads unit primarily targeting the mobile visitors. The new ads format will appear only when someone will visit the publisher’s website on a mobile device. Page-level ads, it refers to as "AdSense's next generation ads." They're designed to help publishers make money from their mobile content. To use them, you place the same code once on each page you want to show ads on, and they'll automatically show at the right time and in the right format. Google says this will potentially increase your earnings without interfering with your users' mobile experience. The new ad formats are anchor/overlay ads and vignettes. Anchor/overlay ads are mobile ads that stick to the edge of the user’s screen Users can easily dismiss them at any time. 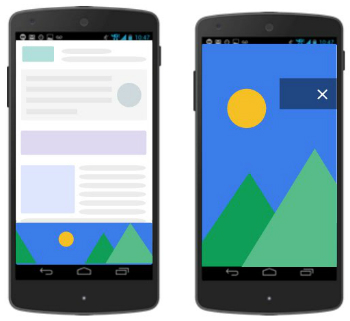 Vignette ads are mobile full-screen ads that appear between page loads on your site. The ads are displayed on leaving a page, rather than on arrival and users can choose to skip them at any time. Publishers can use these Ad Units along with the other 3 ads per page limit. These ads will be displayed on mobile-optimized sites only. The first version of AdSense Anchor ads also called overlays ads, the ads are anchored to the edge of the user’s screen, but they can be dismissed. Vignette ads, like interstitials, are full-screen ads. Unlike traditional interstitial ads, though, Vignettes display when a user leaves rather than arrives on a page. These ads will only show a limited number of times per user. Ads in both formats will not count toward the three-ads-per-page limit and will only serve on mobile-optimized web pages displaying on smart phones. Google says Anchor and Vignette ads are just the first of many Page-level ad formats to come. How to enable AdSense Page Level Ads? Login to your AdSense account and click on My Ads > Page level ads. You need to enable Anchor and Vignette ads by toggling the switch given there. You can have one or both of them enabled at the same time. Once you are done, scroll down to section which says, add the code for Page-level ads to your pages.